Green Bay Police say a former contract worker at Lambeau Field is in custody, after a disturbance at the home of the Packers on Friday afternoon. 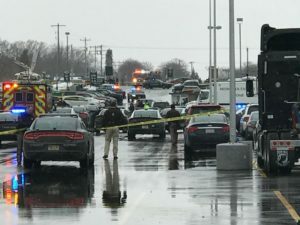 Police were called to the sports venue just after 1:00 pm Friday for what Chief Andrew Smith said was originally a call was for an active shooter on the property. Smith said the man returned to Lambeau Field on Friday and located the other worker. The two fought again and then police say the suspect chased the victim with his car, after the victim fled from his vehicle. Smith says the suspect drove into an open loading dock, and crashed into a storage area. Multiple vehicles in the parking lot were damaged. No weapons were located. Both Smith and the Green Bay Packers said the incident is not expected to affect Saturday night’s game against Minnesota.